From final straightening to machining, United Propeller produces and supplies a rounder, straighter shafting then any of it’s competitors. Western Branch Metals name and reputation is proudly affixed to each and every bar. Aqualoy 22 Alloy provides the very best combination of strength and corrosion resistance. From smaller pleasure craft to the larger yachts, Aqualoy 22 is the boat shafting alloy of choice. Aqualoy 22 provides the best combination of corrosion resistance and strength for marine applications. It is ideal for pleasure boats, considering that these boats spend much of their time docked where corrosion factors may be highest. Aqualoy 22 provides outstanding corrosion resistance. For example, in quiet seawater tests, Aqualoy 22 proved superior to type 316 stainless steel, long considered the standard for corrosion resistance in marine environments. After immersion for nine months, both alloys were covered with barnacles and other marine organisms. After cleaning, the 22 boat shaft was found totally unaffected, while type 316 exposed similarly suffered random pitting and crevice corrosion. Results of laboratory tests also demonstrate 22’s superior resistance to different types of corrosion. One such test involved a 50-hour exposure in an acidified 10% ferric chloride solution. Finally, an 18-month test in actual seawater was conducted comparing 22 with Alloy 400 (Ni-Cu). 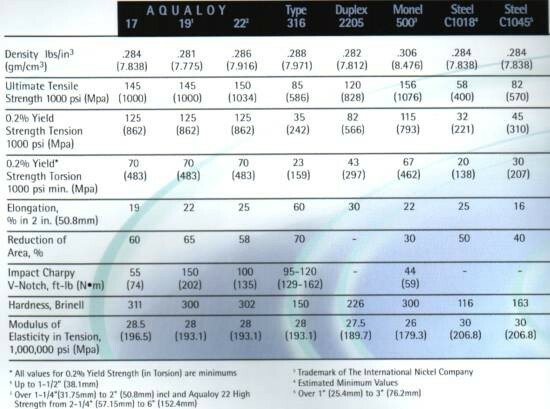 Results showed that Aqualoy 22 was superior. Even though 22 is so highly resistant to corrosion, cathodic protection is recommended to avoid galvanic corrosion in salt and brackish water. Navy Grade zinc anodes, sufficient in number and properly installed, usually provide satisfactory protection.